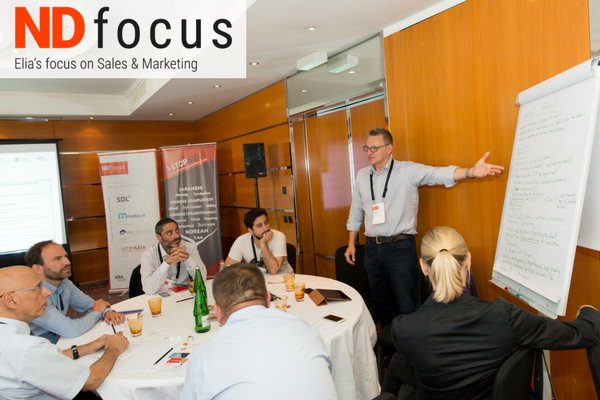 On 6-7 July in Geneva, Elia held an industry first: the inaugural ND Focus – Elia’s focus on Sales & Marketing, the only event designed to set language service companies up for sales success. A total of 53 professionals from 21 countries attended this intimate two-day event designed to provide new approaches and the personal skills for successful sales, with speakers from both inside and outside the industry. More than half of our attendees (53%) completed the survey, and we were pleased to learn that the event met or exceeded expectations for 98% of them. ND Focus – Elia’s focus on Sales & Marketing received a Net Promoter Score (NPS) of 54 where 54% of respondents said that they would actively promote the event to friends, with zero detractors. The top reasons for attending were Continuing education (43%) and Building connections with peers (21%). Almost all attendees gave an overwhelmingly positive response to the General organisation and Venue (96% were satisfied or very satisfied). Additionally, 93% were satisfied or very satisfied with the Communication and the Registration process. We also learned that 86% of attendees were either satisfied or very satisfied with the networking opportunities. However, we are ambitious and would like to see a higher number of very satisfied attendees, so we are grateful for the useful suggestions! All respondents agreed that the workshops had the right balance between learning and discussion, however the Quality of Information scored more highly (an average 70% of said that this was excellent) than the Depth of Information (which 57% rated as excellent). This suggests that future workshops should give more time to complex topics. Attendees were impressed by the subject knowledge of our workshop leaders (Dr. Jan Helge Guba, Samantha Brown, Richard Brooks and Andreas Förster), with 78% rating this as excellent, and told us that the Navigating Negotiations workshop was the most relevant to their work. This is useful to know for next year’s agenda. Speakers included Andrew Lawless and Alessandra Salimbene with a Keynote delivered by Globalization Leader Bruno Herrmann of The Nielsen Company. The presentations were received positively overall, with the Keynote proving particularly popular. We received various helpful ideas for next year, with two prominent themes among these suggestions: a focus further ‘upstream’ on generating leads and prospects, and case studies on aspects of digital marketing such as automation and content marketing that would help to demonstrate the ROI for our sector. As always, we’re very grateful to attendees for this invaluable feedback and look forward to sharing news of the second edition of ND Focus – Elia’s focus on Sales & Marketing in 2018, the event especially created for language service company professionals as part of Elia’s commitment to accelerating their business success. Register now for Prague, PMs!